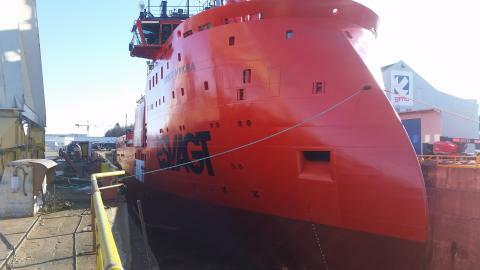 “The ’Esvagt Aurora’ is the largest and most complex vessel that ESVAGT has sent for special survey to date. 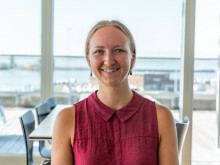 The vessel has been sailing practically non-stop since delivery in 2012 and has only had one day off service”, says Kristian Ole Jakobsen, Chief Operating Officer for ESVAGT. The nine days in dock went according to plan and with a clear cost-conscious focus. The crew took full advantage of the trip to the shipyard; they readied the vessel as much as possible before arrival and worked tirelessly while they were in dock. “We looked into the market in great depth and, for several reasons, chose to put the ’Esvagt Aurora’ in to dock at GMC in Stavanger. Our customer, ENI Norge, requested that we return to location as soon as possible and that the docking was carried out within the designated period, if possible,” says Kristian Ole Jakobsen. “We wanted to spare the time spent transporting the Fast Rescue Boats and Daughter Craft forwards and backwards to the workshop in Esbjerg. We are also very particular that our boats are serviced and maintained according to our own standards for quality and by us, so we chose to send ESVAGT mechanics to the shipyard. It worked out well – the boats were serviced and inspected without any problems,” says Kristian Ole Jakobsen.